Newer drugs such as Ibrance for breast cancer and Lyrica for nerve pain sold well during the quarter helping U.S. based Pfizer. The pharmaceutical giant reported results that were better than had been expected for the second quarter as new products showed growth in revenue. 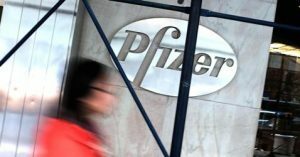 Pfizer and Allergan back in April terminated a planned merger of $150 billion after the White House administration pressured the U.S. based company into backing out of the deal since it would have moved from the U.S. to Ireland as a way to lower taxes. Pfizer shares were down 0.7% in trading before the opening bell. The quarterly results beat expectations by analysts and the pharmaceutical company re-confirmed its yearlong forecast. In the company’s health division, drugs like Ibrance to treat breast cancer, Lyrica for nerve pain and Champix for smoking cessation helped that segment’s revenue increase by 7.2%. During September, Pfizer purchased Hospira in a deal worth $16 billion and since, the company has become the leader in the expanding market of lower priced copies of the expensive biotech drugs. Pfizer, as with many of its peers, faced a number of patent that were expiring over the past few years, along with growing competition from generics, for former top selling drugs such as Lipitor the cholesterol fighter and Celebrex the painkiller. Sales increase by 16% in its established medication business but dropped by 6.1% when the acquisition of Hospira was eliminated as many of Pfizer’s established drugs such as Lipitor, Premarin the menopause treatment and Zyvox the bacteria fighter posted drops in revenue. Costs of research and development at Pfizer were up during the quarter by 0.8%. In all, profit for Pfizer was over $2.02 billion equal to 33 cents per share, which was down from last year’s profit of $2.63 billion equal to 42 cents per share for the same period one year ago. Excluding specific items, the company’s adjusted earnings reached 64 cents per share, which was up from last year’s 56 cents per share for the same period. Revenue for the period increased by 11% overall to end the quarter at $13.14 billion. Analysts were expecting the adjusted earnings at Pfizer to come in at 62 cents per share with revenue reaching just over $13.02 billion.